I feel like not enough people knew of Mary Oliver, who passed away on Friday at the age of 83. I myself, not being a huge fan of poetry, never heard of her work until just a few years ago. Somehow in my enjoyment of nature writing I had overlooked her work. While the poet herself is gone, her legacy is immortalized in an incredible body of work spanning several decades. Like so many people, my introduction to Oliver’s work was her poem Wild Geese. I was working on my ecopsychology certificate in graduate school, and encountered her words in a reading. Initially my attraction to it centered on the imagery of nature, the painting in my head of the movement of pebbles and sun and geese over the land. For years I came back to it just for this picture as a source of solace and joy. But over time it gained a deeper meaning for me. Having been raised Catholic, I was soaked from an early age in the idea of original sin and the idea that humanity is inherently flawed. This, of course, also bred in me a deep sense of guilt and inadequacy, as well as contributing to the anxiety disorder I still deal with today. When I shot forth from these confines as a teenager and landed in the lap of neopaganism, I thought the main thing I wanted was a religion that was centered on nature, rather than seeing it as a set of materials to be exploited. I got that, of course, but what I also got was a lot of fellow pagans carrying a lot of Christian baggage. (1) The need for a higher power to have control of things and to be petitioned for aid; a tendency to divide things into dichotomies like “light” and “dark” or “white magic” and “black magic”; a desire for some authority (often scriptural) to offer clear lines of What To Do and What Not To Do. And with the crossover of paganism with environmentalism, I often ran into sentiments dripping with the idea of sin, guilt, and flawed humanity, like “humans are just cancer on the earth”, and “Gaea is going to make us all pay for what we’ve done to Her”. I carried much of my Catholic baggage with me. I especially yearned for structure and ritual and orthopraxy and definitive methods of pleasing the powers that be, or at least that’s what I told myself I needed in order to be a Really Good Pagan. The crescendo of that particular adventure was the few years I tried putting together a formalized path using various bits and pieces of things I had learned and developed over the years. The harder I tried to make that work, though, the more I found myself rebelling all over again. And that was the key: the idea that humans are not inherently flawed, that we are just another species of animal in a highly complex world full of many ecosystems. Our actions have evolutionary roots, even if we’ve taken them in some beautiful, strange, or even terrible directions. Our large-scale destruction of the planet has largely coincided with increasing beliefs that we are separate from nature; after all, it’s easier to destroy something you don’t see any responsibility toward. Yet here was a call to return to our place in the natural order of things, where we are one among many. From that point, the rest of the poem is a joyful invitation to return home. And I suppose that there is a bit of that shared concept of forgiveness in the idea that no matter how badly we’ve screwed up our lives and the planet–if we stop and do our best to turn things around, nature will still be waiting for us. (3) But it’s not a forgiveness gained through penance and punishment, nor is it dangled over our heads as the one and only alternative to an eternity in hellfire and brimstone. There’s no mention of any specific religion one must adhere to in order to be saved, no threat of damnation. We aren’t required to do rituals A, B and C in order to avoid angering the gods. All it says is that the rest of nature has been there all along, waiting patiently for us to come back into the rhythm of the dance of raindrops and rivers. It will continue on in some form with or without us, but wouldn’t it be glorious if it were with us? There’s a grand, amazing world out there full of wonder and awe. Nature does not dole out sinfulness and punishment, but only natural consequences to actions, which are inherently neutral and not steeped in human ideas about morality. Since that time, my paganism has evolved into something more naturalistic, and anything but structured and formalized. Instead it pervades every element of my life organically and without pretension. I feel constantly connected to something bigger than myself–the entire Universe–which is a key goal of spirituality anyway. Rituals feel redundant, unless you think of my daily farm chores and my meals and my sleep as rituals, all of which celebrate the world I live in in various ways. And I don’t see myself as being part of some cosmic hierarchy; I am not inherently better or worse than any other being here. I am still working on returning to the rest of nature, but it is only because I am unpracticed, not because I feel unworthy. I can be concerned about the environmental destruction I am contributing to by my very existence and lifestyle without letting that concern translate into a guilt that continues to keep me separate as something dirty, foul, not deserving of nature’s touch. And the more I feel close to nature, the more responsibility I feel toward it, and vice versa. Nature may not be an entity that can love me; it’s pretty indifferent as a whole. But I can make up for that with the utter joy and astonishment I experience every moment I am aware of my place in nature and what amazement surrounds me. It’s a cliche to say that you don’t know what you’ve got until it’s gone. I never told Ms. Oliver how much her work meant to me, and of course now I will never have that opportunity. 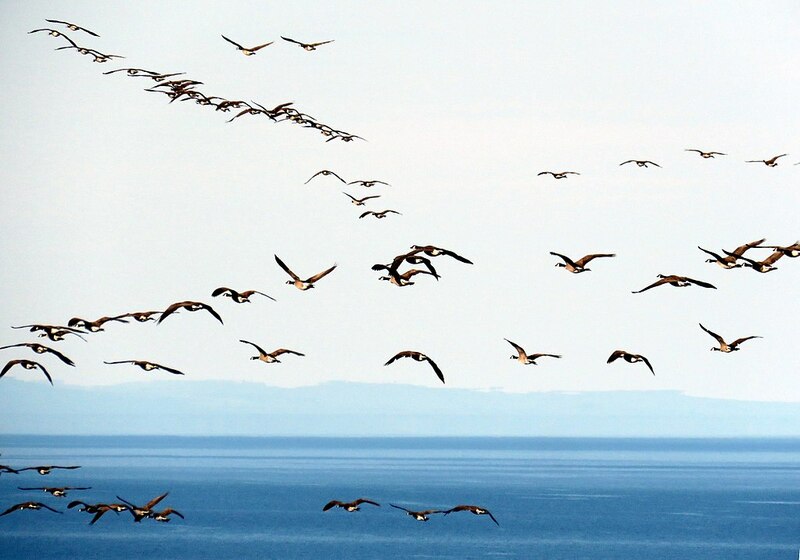 But I don’t think I realized myself the importance of Wild Geese in particular until the evening after she passed, when I began writing this post. And I sent out my gratitude in these words–too little, too late–but hopefully enough to share that meaning with those who remain. 1. Obviously, yes, #NotAllPagans. But after over two decades in this community, I’ve seen these and other leftover Christian patterns frequently. These phenomena do also occur in other religions, and arguably in some pre-Christian paganisms. But it was clear in the instances I saw that the patterns were most closely replicating those many of us were raised with in Christianity, with a thin pagan veneer pulled over them. 2. I recognize this is a pretty romanticized view of “instincts”, and that hunting and other violent things are also instinctual to a degree. That’s not what this is about, though. Leave those aside for the moment. 3. Of course, with climate change being what it is, it may not be able to wait for us much longer, at least not in a form that allows us to survive as a species. But leave the doomsaying for some other time and place. All it does is make people less likely to try to improve things, and more likely to just give up, and that is antithetical to what this entire post is about. Beautifully expressed. Thank you for sharing your feelings about Mary Oliver and your personal evolution. I too have been touched by Wild Geese. NPR ‘s “On Being” program reran an interview with Mary Oliver this past week. If you haven’t heard it you might want to find it. Thanks. Thank you for your kind words, and the recommendation!